The First Life Science (FiLS) Program team has been back in action in the Bancroft Elementary classrooms since January 26th. 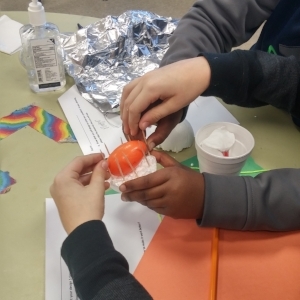 This school year, the students have been busy bees as they combine Science and Engineering practices with their favorite cartoon characters from Pokémon. The end product is “Engineering for Pokémon .” Throughout the remaining weeks of school, the students will solve a number of problems that their Pokémon get themselves into. So far, the students have demonstrated a growing understanding of Engineering and have demonstrated some of its principles. They have learned to identify a problem, brainstorm potential solutions, test their solutions, analyze their results and then make improvements. For the past 5 classroom sessions they have been solving two very important problems in the Pokémon world. 1. How can we safely get Pokémon eggs down from the top of a mountain, if we are unable to carry them with our hands? Some students created parachutes, others created a pulley that can lower the Pokémon eggs to the ground and others created special ‘crash-proof’ containers that can protect the eggs from damage. 2. How can we create a Pokémon hotel where Pokémon can safely stay? Since each Pokémon has special powers, their hotels must be able to withstand those powers. For example, Squirtle’s hotel, must be able to withstand powerful blasts of water (from a water gun or spray bottle) since it is a water Pokémon. During the final week of the first term, we will see just how well these hotels have been designed. Be sure to come back to check out the videos! Who's hanging out on the newly designed stairs?